As you have undoubtedly heard, the current Bull Market in U.S. stocks (S&P 500) is the longest in recent history--though some historians claim that Rome's SPQR Index rose steadily though most of Emperor Augustus' 40-year reign from 27 B.C. to 14 A.D., easily topping the current rally's 10-year run. It's also possible that the longest Bull Market occurred circa 2580 B.C. in Egypt, as a result of quarry stocks soaring for decades during the construction of the Great Pyramid at Giza. The unprecedented outpouring of wealth for labor and materials boosted the stocks of a variety of sectors, from quarries to shipping to breweries slaking the thirst of the thousands of laborers toiling on the project for the better part of a generation. Why do epic Bull markets that grind higher year after year finally expire?Analysts have various economic and financial reasons they tout: Treasury bond yields invert, debt begins to drag on growth, authorities raise interest rates too steeply, and so on. But the uncomfortable reality is all Bull Markets, no matter how lengthy or robust, all expire, and continuing the policies that fed the Bull from now until Doomsday won't change that reality. Perhaps it comes down to the human psychology of hubris and complacency.Players get overly confident even as "animal spirits" start waning. Then there's the Skyscraper Index, a.k.a. tallest building in the world Curse-- a host of "the tallest building in the world" projects are either under construction or on the drawing boards, an intuitively appealing signal that the stock market is topping out. 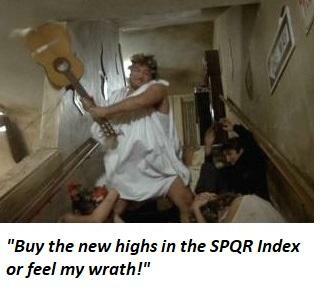 But while we wait for hubris to work its Bull-killing magic, "Buy the new highs in the SPQR Index or feel my wrath!"